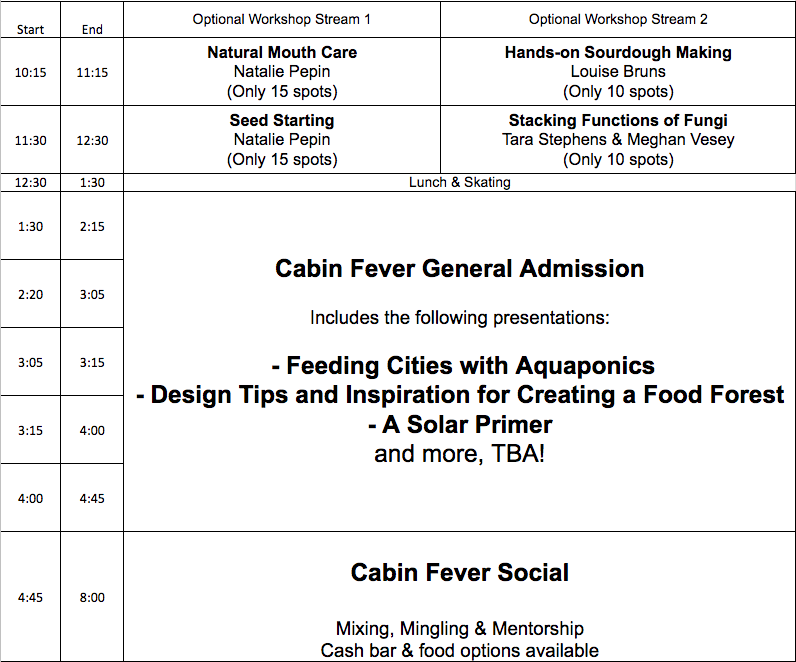 Cabin Fever is an opportunity for the the PCG to inspire our community to pursue their permaculture goals and this year we are providing some great Presentations on a variety of topics including, solar power, aquaponics, native bees and the fruit-growing possibilities of our fair city. We will also be holding a limited number of hands-on small workshops… these are at an extra cost, but they will also include something you can bring home with you on top of the knowledge to go confidently into a new space. Some of these will be herbal medicine and sour dough bread making, Final details will be announced here, on the PCG webpage and through our Fb page. Pssssttt…. Members get $10 off!! All members in good standing will receive a coupon via email for a $10 discount. Not sure if you are a member? Check our directory: https://permaculturecalgary.org/membership-levels/directory/. Contact events@permaculturecalgary.org if you did not receive your coupon code! 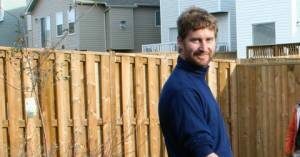 Devin is a certified Permaculture Designer and Teacher, and a jack of all trades. With a keen eye for interrelated systems, Devin likes to utilize a unique approach to holistic systems design. He’s a firm believer that the solutions to many problems, large or small, can be found in the principles of Permaculture. From agricultural design to waste and water management, and everything in between. He specializes in Aquaponics, a soil-less growing system that utilizes fish for plant nutrients. He’s a professed minimalist, an advocate for mental health, a breaker of barriers, lover of music and the arts, and believes in unlimited human potential. Tired of spending hours mowing, watering, and weeding; only to have a yard that gives you no yield in return? Let Adrian Buckley of reGenerate Design introduce you to the concept of edible forest gardening, aka, food forestry. This is an approach to creating your own beautiful, low maintenance, nutrient-dense edible garden that is inspired by the stability and resilience of natural ecosystems. 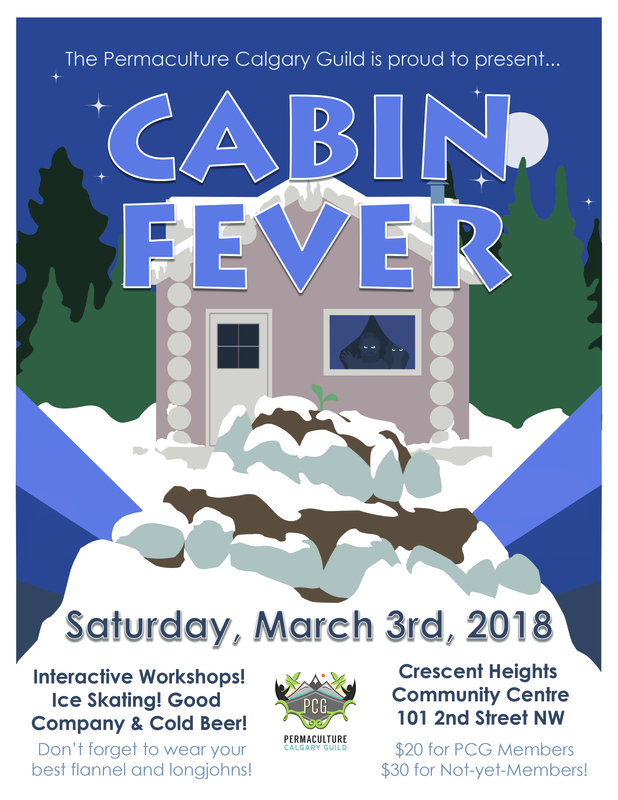 In this workshop, you will get to know useful plant species for the Calgary climate, gain practical tools to take your food forest from ideas to fruition, become familiar with design methodologies and strategies to plan a food forest, and hear our experiences to help avoid costly mistakes and achieve your goals faster and more thoroughly. 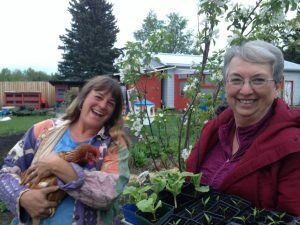 Get excited about what is possible when using this world-changing and land-healing gardening approach! Adrian Buckley has a Bachelor’s of Community Design and completed a Permaculture Design Certificate in 2009. 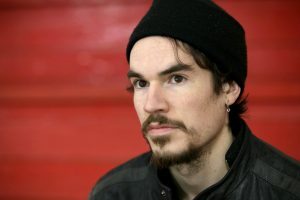 Before reGenerate Design, Adrian founded and operated Big Sky Permaculture, where he taught courses in permaculture design, and has extensive experience implementing dozens of ecological design and build projects in Calgary and surrounding areas. Adrian also started and directs the Calgary Harvest project, which aims at bringing people together to harvest local unused fruit from registered trees in Calgary. reGenerate Design is an ecological design-build firm based in Calgary, Alberta. Their passion lies in discovering integrated and resilient solutions for the design of human ecology and habitat. They create holistic design solutions and empower people to be leaders for positive change. Everything you want to know about solar power and the current government subsidies that are available. Lisa is an off-grid living, sheep rearing, garden crazy permaculuralist. 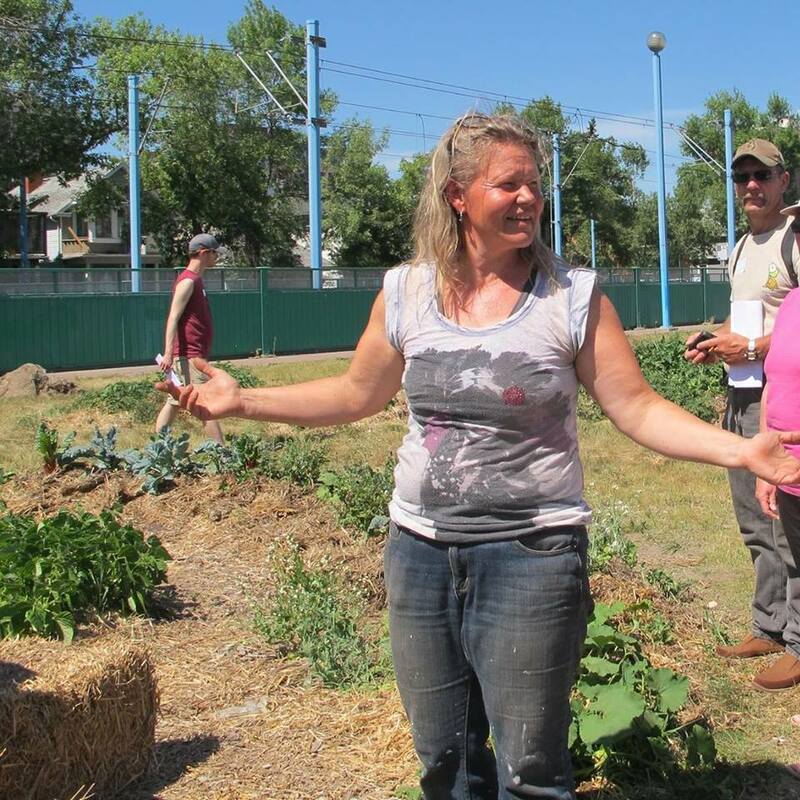 She is also president of the Permaculture Calgary Guild. This talk will focus on giving a general overview of the amazing diversity of native bees within our province which often times goes un-noticed. Many ‘myths’ relating to bees and bee ecology will be addressed and I will highlight the importance of diversity in pollinators rather than the alternative of honeybee monocultures. Gardening and yard care tips will also be provided to highlight the best way to feed and maintain native biodiversity throughout our growing season as well as how to ensure they come back in following seasons. This talk will also highlight nesting and overwintering habitats. Lexi’s Bio: I have 3 children and have taught at MRU for more 20 years, in several areas of biology, but my passion is ecology. I went back to school in 2010 and completed my Masters at the U of C, in pollination ecology. My research focused on clearcut logging impacts on bumble bees. Since then I have given countless talks and workshops to horticultural groups, gardening clubs, naturalist clubs, etc. on native bees, their diversity, and especially its importance, as well as how people can help maintain this diversity through the creation of bee-friendly habitat! I have been involved in setting up, or facilitating, several bumble bee monitoring programs including one in Turner Valley with the local elementary school, to try to monitor for a potentially threatened species of bumble bee; the western bumble bee. More recently I helped co-found the Alberta Native Bee Council and am excited to begin our Bumble bee monitoring program this spring, a citizen scientist outreach program aimed at getting the general public involved in conservation efforts, as well as raise awareness on the plight of native bees and best ways to encourage their persistence in the environment. I have also been a volunteer with the Alberta Science Network (ASN) for the past 8 years and enjoy teaching children about bees (and other insects), ecology, and getting them excited about anything ‘science’! Given the age of misinformation, I think one of my main goals as a scientist is getting the right information out to the public so they can make better and informed decisions as well as to inspire the same passion for ecology that I have! Natalie is staying home this weekend due to the impending snow storm (she lives north of Edmonton!). We thought it wise to cancel given the potential road conditions. We found two marvellous speakers to take her place. From The Light Cellar website: Denis rhymes with Bee has a deep love for such fine pursuits as herbalism, gardening, wild food foraging, fermentation of food and honey wine and drinking chocolate. Denis teaches all about the healing powers of Medicinal Mushrooms, Chocolate Drinking, Staple Wonder Foods and Much More! Born in the Foothills of Alberta, Denis is an Apprentice Herbalist with The Wild Rose College of Herbalism and spends all his free time Barefoot, Being Bounced Upon the Bossoms of the Earth Mama! You are most certainly in for a spectacular time if you have the chance to attend one of the workshops Denis puts on. We are very lucky that Chelsie Anderson of Chelsie’s Garden SOIL-utions has been able to step in at the last minute to lead this hands-on workshop on seed starting. Chelsie will be sharing her wealth of knowledge about seeds and and growing and the differences between starting in natural soil vs potting mix. In this workshop she will be helping the participants through the difficulties of 3 of Calgary’s favourite crops: potatoes, tomatoes and peppers… Who doesn’t love a little deadly nightshade in the morning? A fixture on the Calgary gardening scene, she is often busy doing workshops, giving presentations and sharing her love of Gardening. When she isn’t busy with her hands in the dirt she creates with words! Chelsie’s recently published book is part gardening journal and part personal growth experience. She combines 2 of my favourite things; gratitude and gardening. Get in on this fabulous opportunity to learn from one of Calgary’s best! Learn how to make sourdough in this hands-on workshop! Louise Patterson Bruns was born and raised on this farm that her grandfather homesteaded in 1902. Louise has 40 years of teaching experience and received a Permaculture Design Certificate in 2010. Louise is a fountain of knowledge about everything from classical music to wildcrafting. From her website (http://www.pattersonspringsfarm.com/): This 80 acre farm in the foothills of southern Alberta has been in the Patterson family since 1902. We have a passion for history and the environment that we would like to share. We offer workshops in Permaculture and Pioneer Skills such as growing & preserving your own organic food. Through our monthly home delivery service, we offer fresh produce, home baking and farm fresh eggs. It is surprising how often fungi are overlooked in our culture given the critical roles they fulfill in our food- and eco- systems. Although the permaculture community has long embraced these incredibly important and fascinating organisms, we too tend to gloss over them when it comes time to incorporate them into our designs and installations. This presentation will explore why fungi are an integral component of the permaculture approach and spark ideas of how to integrate them into your designs. Each participant will leave with a coupon for mushroom spawn that can be redeemed at the Fungi Akuafo online store. 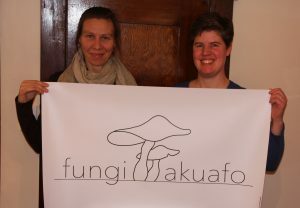 Meghan and Tara became friends at a Permaculture Design Course in 2014 and when the opportunity arose in 2016, joined forces to start Fungi Akuafo. Together they are contributing to our local food system by making growing fungi more accessible to small farmers, DIY growers and designers. Their approach is to serve as a local source for mushroom spawn and information hub to explore the many roles fungi play and the techniques used to cultivation them.